I just had to make another one of these cute purses using the Top Note die. 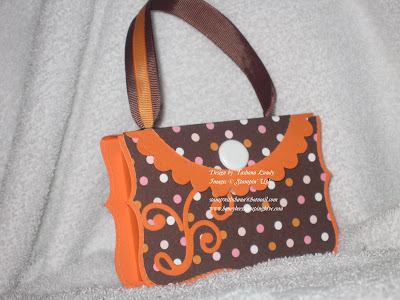 For this purse I used the Sweet Always DSP and Only Orange card stock. I ran some Pumpkin Pie 1/4" ribbon down the center of the Chocolate Chip ribbon to create the handle. I used a Jumbo brad for the button on this purse. I also gave it a little flare with the Swirls and Scribbles die. Enjoy your day. Leave me a comment and I will enjoy mine. are you going to the stampin up convention in July?